"A charming riad that is a convenient and quiet oasis from which to explore the city" - House and Garden. "A modern day 1,001 nights" - Hello! 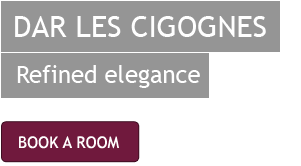 "Experience of the world of 1001 nights in Dar Les Cigognes!" "The dream of 1001 nights - Dar Les Cigognes"
At Dar Les Cigognes we offer a full-service spa with a wide range of beauty treatments including facials, manicure and pedicure, waxing, and traditional Moroccan henna tattoo. 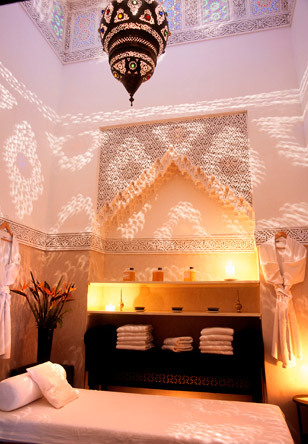 The highlight, however, is a traditional hammam and gommage, which is a cleansing and highly relaxing experience. Followed by a massage by our massage therapist and you will truly feel the weight of the world melt away. Working with a world-leading health and beauty pharmacist with 40 years specialism in natural products, we have developed our own range of massage and bath products based on the powerfully anti-oxidant Argan oil. Our products are organic and are sourced locally and come in a sublime range of scents. The treatment room was described by the Sunday Times as, "one of the most sublime massage rooms I have ever seen, a cathedral to pampering and well-being." The spa is available for the use of resident guests only.